Lucy Gascoigne’s MG ‘Record Breaker’. The appearance of this car on eBay at the tail end of 2008 took many people completely by surprise. It was known to a number of enthusiasts where the car was and they were given to understand that its future was secure, but events were to prove otherwise. The car dates back to the very early days of the Pioneer Model Car Club, which was formed by enthusiasts following the first organised tethered car meetings on the factory rooftop in London. Among them were Jim Cruickshank, who worked in the blind making factory where these meetings were held, Jack Morgan, and Jack Gascoigne who was a partner in a heating company. 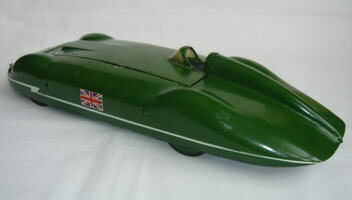 Both Gascoigne and Cruickshank who had campaigned tethered hydroplanes prior to WW2 built semi-scale models of the ‘Magic Midget’ that MG cars had created in 1931 for George Eyston to race. 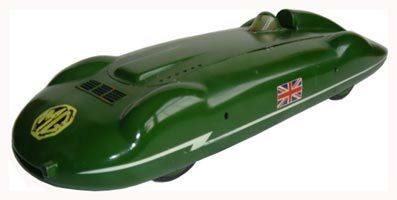 Late in 1945, Jack Gascoigne, assisted by his wife Lucy and Jack Morgan set about building a replica of another car built by MG in 1935, again for Eyston, but this time specifically for record breaking. In the hands of Gardner, the car broke numerous class records. On one notable occasion it recorded 203 mph as an 1100, the engine was rebored beside the road and it then took the 1500cc record at 205 mph. The car re emerged after WW2 and continued it’s record breaking. A 750cc engine that had been built in 1939 powered the car to a record in that class of 159mph. 2 of the cylinders were then fitted with dummy pistons so that it could run as a 500cc. A quite remarkable car. A fundamental error in one of the first reports about the model attributed it to Mr and Mrs Cruickshank, but commented that the ‘delightful little scale MG breaks new ground in design’. Most obvious was that the low bodyline meant that the engine could not be upright. Also, Gascoigne favoured fabricating his chassis from either steel or aluminium sheet and these two factors combined to create a model quite different to any other cars of the period. What is not generally appreciated either, is just how small the model is. The engine based on a Westbury designed 5cc Kestrel is mounted horizontally and occupies virtually the whole width of the car. Construction of the chassis is very simple, a flat sheet of aluminium for the floor of the car, with two vertical frames that have the top and bottom edges flanged, bolted to it. The drive axle had to be made especially for the car as the input shaft and bevels are at the extreme left hand end. This in turn is bolted to the vertical frames. The rear axle runs through the frames in bushes. Wheels were built up from discs, bolted together with a solid piece of rubber to form a tyre tread. Attached to the Kestrel are a centrifugal clutch and a cable operated ‘pull start’ mechanism that Lucy used, while her husband stuck with the traditional leather cord on the flywheel. A fuel tank was mounted ‘pannier’ style on the outside of the left hand frame, while a coil was mounted in a cut out in the right hand frame. A pair of NIFE cells and a ‘knock off switch made from a radio rotary switch completed the car. 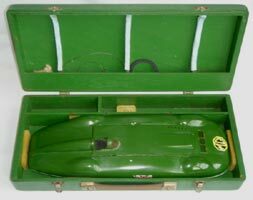 Rather than a large pitbox, the car had its own fitted case, with space in the lid for lines and bridles. It is worth recalling that the Gascoigne ‘workshop facilities’ comprised of a small bench in the kitchenette of the family flat. The only machine tool was a Drummond lathe. Any ‘heavy’ work had to be farmed out or done elsewhere. The first appearance of the ‘Gascoigne MG’ that was to become so well known, was at Eaton Bray in September 1946 where it was described as a ‘most interesting newcomer’. Following several test laps in the morning, with the new engine being ‘treated gingerly’, it was entered in the Drysdale ‘Concours’ for unfinished models. Later that month it was taken to a Pioneer Club Meeting in the Royal Horticultural Hall where battery trouble prevented a run of any sort. Three weeks later at Eaton Bray on Oct 20th, Lucy Gascoigne was photographed with the car in her hand, showing clearly that it was a very small model. Although the bodyshell was not finished, it represented an amazing piece of craftsmanship, as it had been hand beaten from Aluminium sheet, to an almost perfect scale replica of the original. On this, its debut race, it recorded its first ever victory with a win in the ½ mile handicap event at 37.5 mph. Already noticeable was instability, caused by the small diameter wheel, hard rubber tyres and lack of suspension. Back at the Horticultural Hall the following weekend, it made ‘several successful practice runs approaching 40 mph’. 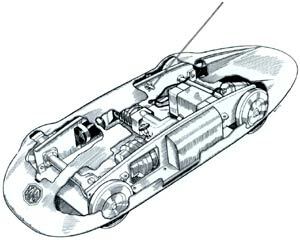 In December 1946 Model Cars published a sectioned drawing of the car by Laurie Bagley accompanied by a brief description and the comment that it was one of the ‘most intriguing model cars of 46. One aspect of the car that was not quite so well received was the exhaust. Owing to the Kestrel engine being horizontal, the exhaust pointed directly down through the chassis pan and onto the track. In order to comply with the regulations, a deflector was fitted to direct the exhaust sideways, but still under the car. 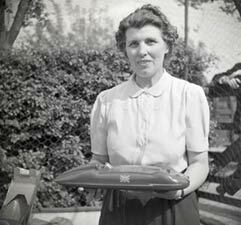 The 1947 season initially proved frustrating for Lucy Gascoigne as the car failed to live up to its promise of the previous year. From the rearranged Austin trophy meeting, run indoors at Eaton Bray in January, right through to Whitsun it failed to beat 30 mph and was still noted as ‘jumping about a bit’. The Whit weekend meeting at Eaton Bray saw the car revealed in all its glory for the first time, with the body now completed and painted in the appropriate British Racing Green. The correspondent in Model Cars described it as ‘the beautiful Gardner MG’. The quality and accuracy of the model accounted for Harold Pratley awarding it a maximum 50 marks in the concours section of the Russell trophy at this meeting. This, combined with a run at 31.5 mph would have been the winning total of the 15 entries had it not been for Gerry Buck, who only scored 30 in the concours, but made a run of 76 mph. A very creditable second none the less. 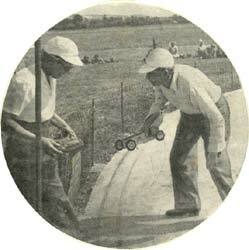 Lack of speed was not a problem when the Pioneer Club provided demonstrations on the circular track at the Model Engineer Exhibition. 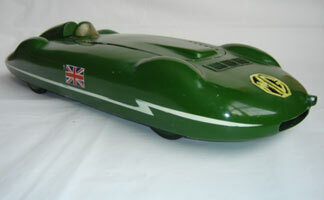 The car was displayed at the opening of the Surrey Club track at Christmaspie, but insufficient ground clearance for the streamlined tail prevented it running. The trip to Eaton Bray in July was a ‘non event’, as ignition troubles proved insurmountable and stopped the car running at all. Clearly showing that the scale approach had its champions, ‘Jerry Can’, in his ‘Dope and Castor’ column in Model Cars, commented (that) "Models are steadily growing better looking. Hearty congratulations on a really charming little car Mrs Gascoigne". One suspects that the two Jacks put in some serious work on the car over the next couple of months as it reappeared for the September Eaton Bray rally raring to go. It may have been at this stage that the fuel tank was relocated to the centre section of the chassis. The car however ‘rocketed’ round the ¼ mile at 37.1 mph and the ½ mile at 37.8 mph to give Lucy second place in the Jaguar Trophy. This result was most fitting as the guest of honour at the meeting was none other than ‘Goldie’ Gardner, multiple record holder with the full sized car. He was so fascinated by the lovely model version in the ‘Pioneer pit’, that Jack Morgan asked him to autograph it for them. With no pen immediately to hand, Gardner scratched his name into the inside of the aluminium engine hatch. The founders of the tethered car movement, and in particular the Pioneer Club, were firmly of the opinion that the models should closely resemble full sized cars, and the move away from this in the pursuit of speed would ultimately lead to many of them retiring from the sport. 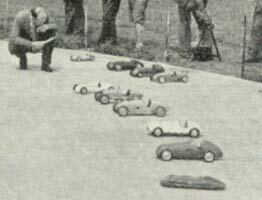 To encourage the aspect of realism, several competitions, such as the Russell Trophy, included a ‘concours’, or scale, judging element. The MG would always score very highly for this aspect, but was marginal on speed when it came to combining the totals. The Rickard Trophy in October that was judged by Rodney Clarke was a case in point where good static marks were compromised by a ¼ mile run at 43.1 mph and no run at all for the ½. A month later, Lucy Gascoigne had two of her best ever runs with the car. 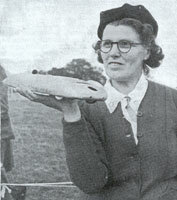 At the Horticultural Hall on 8th Nov, she ‘earned applause from the crowd with a run at 50.1 mph’ and at the opening of the new Handley Page track the following day took the class prize at 53 mph. This is possibly the fastest ever run for the car and it was reported that ‘it rocketed round’ and the speed ‘was no mean feat on such small diameter, unsprung wheels. Just three days into 1948 the car was ‘largely airborne and somewhat erratic’ during a 43 mph run at the Horticultural Hall. The car was put on show at the British Racing Drivers Club exhibition at Henley Hall in London during January where it attracted a great deal of attention. 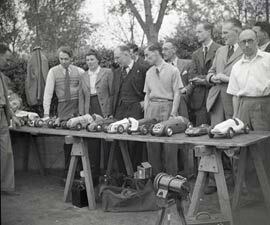 Lucy was photographed showing her car to a very informed group of enthusiasts that comprised Earl Howe, Countess Howe, the Duchess of Devonshire and Sir Malcolm Campbell. In the slightly less exotic surroundings of the Rego clothing factory, the newly formed Edmonton Club held its opening meeting on the 7th February where runs of 36.5 and 39.8 mph would see Lucy finishing second to Basil Miles. Another 50 point maximum for the concours at the Russell Trophy meeting at Eaton Bray was backed up with a run of 45.35 leaving Lucy with the highest placed 5cc car but in 10th place overall. The Gascoignes travelled to Worcester at the end of June to run at the official opening of Geoffrey Hastings’ private track. Although a thing of beauty, with the elderly Kestrel not providing sufficient ‘urge’ and the small wheels the car was no longer competitive, but its career was not over. Jack Gascoigne was working on another scale 5cc car for his wife; an ETA 29 powered Dowson Lightweight, although it would be a while before she would be able to run it. In the Drysdale Trophy, two cars are run one after the other with the total time, including starting and changing cars being taken. For this event, ‘Team Gascoigne’ comprised Jack with the Dowson and Lucy running the MG.
Left: Change over of cars during the Drysdale Trophy, Dowson having completed its run. Below right: Starting the MG for the second run. 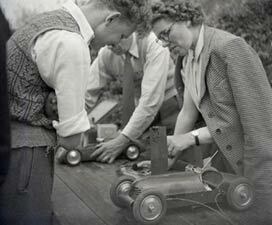 Lucy did not run her car at the Pioneer meeting in January 1949, although in a somewhat patronising report, Model Car News commented that the car was ‘evident in the pits’ and that ‘Mrs Gascoigne confidently answered questions showered on her by fascinated spectators’. 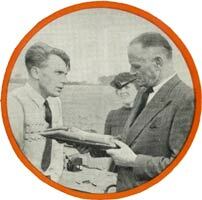 Two other appearances were for trophies, both donated by the late Percival Marshal of Model Engineer. In the Presidents Trophy at the Pioneer Club in July Lucy finished second to master craftsman, Arthur Weaver, while at Eaton Bray the car scored just 44 marks for workmanship, but made no run. This was really the end for the racing career of Lucy Gascoigne's MG ‘Record Breaker’. 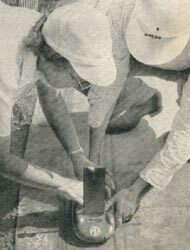 It was to be almost two years before she was able to run a car again as she was taken seriously ill. By the time she had recovered sufficiently, the tethered car scene had change quite dramatically and it was with some sadness and bitterness that most of the ‘Pioneers’ moved away from tethered cars into other branches of modelling. Jack Gascoigne returned to the world of model powerboats, before becoming a true pioneer in radio control yacht development. On his retirement he moved down to Bournemouth and ended up as Commodore of the Poole Model Yacht Club for 10 years. Just a few days before his sudden death in January 1978, he helped launch the Solent MYC. 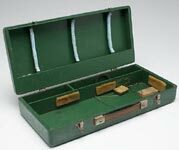 The MG with its purpose built carrying case passed to Jack Morgan who retained it, along with his own 10cc Red Fox and 5cc Vixen cars. Following his retirement he moved to Norfolk and in 1996 became President of the newly formed Retro Racing Club. In the first issue of the Club newsletter he gave an account of his involvement in the very beginnings of tethered car racing in Britain. He also described how he and Jack Gascoigne had built the MG and the circumstances surrounding Gardner signing it at Eaton Bray. In a later edition of the newsletter he was pictured with the three cars and took great delight in refusing regular and ever increasing offers for them from an internationally known collector. Those members of the Retro Club that were in contact with him were given to understand that he wanted the cars to remain within his family. Unfortunately Jack Morgan died in September 2000 aged 88, followed a short while later by his wife. It was not until Vixen and the MG appeared on eBay that anyone knew that that the family had parted with them. It transpired that at least two cars were sold at auction in London, probably towards the end of 2006, but how this came about is a mystery at present. Certainly no hint of their sale reached any enthusiasts in the UK and it is not even known if they were sold at one of the major auction houses. The whereabouts of Red Fox is not currently known, but an American, who travels the world looking for unique items, bought Vixen and the MG. (see update) He returned to the States with the cars where they remained in storage for a while before asking a friend to sell both of them on eBay towards the end of 2008. What followed were two of the most bizarre auctions seen so far. With the Stubbs Austin and Bernard Manley’s car having been up in the £2000+ bracket and lesser cars making almost as much, the lowest estimate for the MG was £2500. Given its importance, recorded history and impeccable provenance, it would not have been out of the way to have seen it heading towards £5000 or even beyond. Vixen had equally good provenance but was probably slightly less well known and was not expected to do quite as well. In the event, and to the amazement of everyone in the UK, Lucy Gascoigne’s MG sold for just £1300, with the Vixen making a few pounds more. With the pound in freefall against the dollar and the costs involved in re-importing the car, perhaps British bidders were reluctant to get involved in an auction that they did not believe they had any realistic chances of winning. Inevitably, having seen the final price, many commented that they ‘would have made a bid if they had known how much it was going for’! Of course, this does not take into account how much the high bidder might have been prepared to pay. It does not explain either why there was so little interest from the rest of the world though, as it will be a long while before two British cars any more important than these appear on the open market. The MG now resides in Connecticut on the east coast of the USA. The astute bidder and lucky winner of the auction was Guy Martin, who has been kind enough to supply photographs of the MG and share information about himself. He has been an enthusiastic collector for 15 years or so, and has amongst his cars, a very nice and original M&E Special with a Keil K6 motor that was featured on the On The Wire website in September 2008. Both he, and his father, who has been an antique dealer for 50 years, collect cars having been ‘bitten by the bug’ after seeing a tethered car at an antiques fair. Guy has developed a very informative website www.tethercar.net to help others that share similar interests and aid with the identification of cars that they might have. On reflection, Guy regretted that he did not just go a few dollars more in the auction for Vixen. There are many cars in collections that are identifiable, yet no one has recorded their history, so it is a great pleasure to be able to put together the story of the ‘Gascoigne MG’. Thanks to Peter Hill of the Retro Racing Club and Guy Martin for all their help in producing this article. Update July 09:- Through some further research, Guy has managed to establish the recent history of the car before it appeared on eBay and his successful bid. We are most grateful to Guy, and Stephen Kowalski for solving this mystery. I am happy to provide you with the information I can regarding the MG tether car, as I am the person who purchased it. I was on vacation with my wife and daughter in London in July of 2007. We spent much of our time with a friend of mine and fellow clockmaker who lives in London. We took a drive to a popular area of London where there are some neat shops and restaurants. I wish I could remember the name of the area, but it escapes me. I think it was in the SW part of the city, and a desirable neighbourhood. There was a women's' dress shop which sold a lot of vintage clothing. In the windows, as displays, were several models - a couple of tether cars, ships, a submarine, and a couple of other items. I noted that the models were quite exceptional and enquired as to whether they were for sale. The proprietor of the shop said that she had inherited them from someone who was somewhat of a brilliant engineer, and that yes, she would sell, them, but not cheaply. 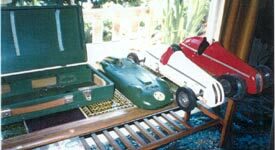 I bought the MG racer, another tether car, ('Vixen') and the handmade electric U-Boat model, and somehow managed to ship them back to me in California with my friend's help. I cannot recall how much I paid for the car, as it was sort of a package deal, but I recognized the precise nature of the models and the engineering involved, and felt like I got a pretty good deal. I was interested in the MG specifically because at the time I owned a beautiful 1950 MG TD, in exactly the same green colour, and having several MG books on hand, I recognized the streamlined racer as an important MG car. The model spent it's life with me living in our home on San Francisco Bay in a nice display cabinet along with other special items, including a baseball autographed by Babe Ruth (probably America's most famous sportsman ever), a model of Rourkes Drift, A San Francisco 49ers football team bobblehead doll from the 1950's, a box autographed by Charlie Watts of the Rolling Stones, and a couple of early French tank models from the First World War, among other items. I have collected stuff all of my life, but for the past year I have been reducing my collection for many practical reasons. I enjoyed having the MG, and am glad it is now in the hands of another party who seems to really be enjoying it. Update:- Sept 2014 Since this was written the car has changed hands again and now resides in California with long-time OTW supporter Ron Reiter. Jack Morgan's 10cc car 'Red Fox' has also turned up most unexpectedly and is now with a member of the Retro Club. 'Vixen's' where-abouts are still unknown.